The Swinging Bridge is about one mile east of the Colorado-Utah border and the only permanent crossing of the Green River in the area. It is in need of reconstruction after an employee of rancher T. Wright Dickinson put a tractor through the decking in 2014. CRAIG — After a nearly four-year partial closure, repairs to the historic Browns Park Swinging Bridge in western Moffat County will begin next month. 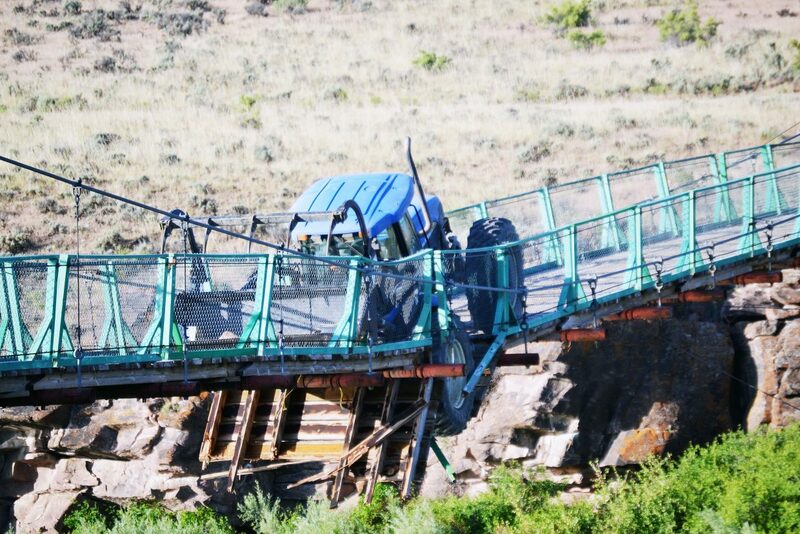 The bridge and surrounding area will be closed to the public April 2 through Aug. 1, said Moffat County Director of Development Services Roy Tipton in an update provided to the Moffat County Board of County Commissioners during its regular meeting Tuesday morning. Since a tractor over the bridge’s weight limit partially fell through the bridge in summer 2014, the bridge has been closed to vehicular traffic. The closest crossing on the Green River is the Bridge Hollow crossing, which adds an additional 30 miles to the trip across the state border. Commissioners Ray Beck and Frank Moe praised the repairs. Beck mentioned the importance of the Swinging Bridge in accessing public land on both sides of the river. “This is huge for Moffat County,” Beck said. In addition to the update, the BOCC also took action on the following items. • Approved a resolution in support of removing Endangered Species Act protections for gray wolves in Colorado and implementing recommendations made by the Colorado Wolf Management Working Group. • Approved the payment and transfer of payroll warrants. • Signed a contract with Mountain States Electric for repairs and upgrades to the Fairgrounds Arena Lighting. • Heard updates from the Finance and Road and Bridge Departments.